When you make food fun for kids, they want to eat it. So these recipes include healthy options as well as treats -- all designed to appeal to even your pickiest eaters. Many of these recipes are also easy enough for kids to make themselves. So if you enjoy cooking with your kids, or you want to do a special cooking project at the kids' school or camp, these fun kids' food recipes will give you some great ideas. 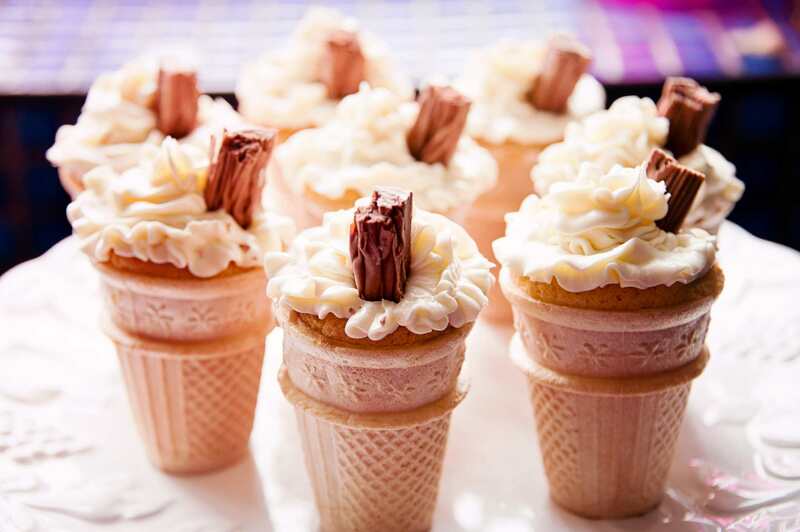 These ice cream cone cupcakes are everything fun food for kids should be: fun to make, fun to look at and even more fun to eat. Rice crispy treats are the very definition of fun food for kids, and this rice crispy treats recipe is one you won't mind making again and again, because it's made with wholesome peanut butter and brown rice syrup, making it a bit healthier than the classic rice crispy treats. This sweet party mix is one of those fun kids' foods that adults like, too. This recipe is also super easy to make - young kids may need help with the oven. Ever see a preschooler's face when you tell him you're going to make dirt for dessert? It's priceless. This dirt cake is one of those fun kid food recipes that's perfect for special occasions. Want the same idea for an afternoon snack? Check out my dirt dessert cups recipe.